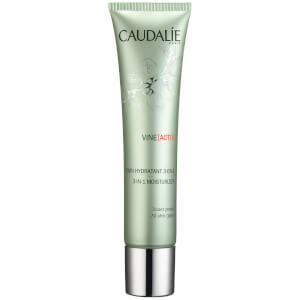 Replenish dry skin with a boost of hydration with the Caudalie Vinosource Natural Hydration Heroes Set; a soothing trio that comfort even the most sensitive skin types. The set combines a facial water, serum and moisturiser from the label’s Vinosource range, which combine to protect skin against dehydration. Expect a calm complexion with nourished and hydrated skin. 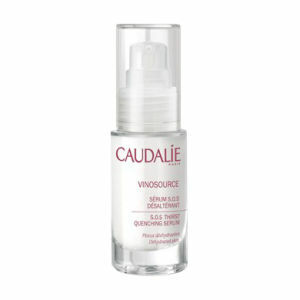 A weightless mist extracted during the grape harvest in Bordeaux to soothe and revitalise skin. Catering for all skin types, including the most sensitive, the luxurious spray utilises polysaccharides and mineral salts to hydrate, moisturise and balance your complexion. Can be used as a toner, or on-the-go to rejuvenate skin. Ultra-concentrated and extremely natural (97%), this serum constantly and intensely hydrates and soothes all skin types, even the most dehydrated. By capturing and continually diffusing water deep within the skin it restores the skins natural moisture balance and leaves it feeling soft and supple. This high potency serum is a “plant-based moisture surge” for emergency use or use all year round. A gel-cream formula developed to deliver immediate soothing properties for long-lasting comfort. Infused with calming Chamomile and Organic Grape Water to hydrate skin, the refreshing sorbet is ideal for skin types that experiences sensitivity. Experience smooth, soft and soothed skin with reduced redness. Grape Water: No need to blot after spraying. Can also be used as a toner after cleansing. Tip: Keep the spray in the fridge to make it even more refreshing. Serum: For dry skin, use as a base and follow with moisturiser. Apply morning and evening to a cleansed face and neck. Avoid the eye contour. Sorbet: Morning and evening, on the face and neck. Tip: Apply it as a mask and leave it on for intensely hydrated skin. Grape Water: Vitis Vinifera (Grape) Fruit Water*, Vitis Vinifera (Grape) Juice*, Nitrogen. *Plant Origin.